The image above shows the Old Orange County Courthouse in Santa Ana around the 1910s. 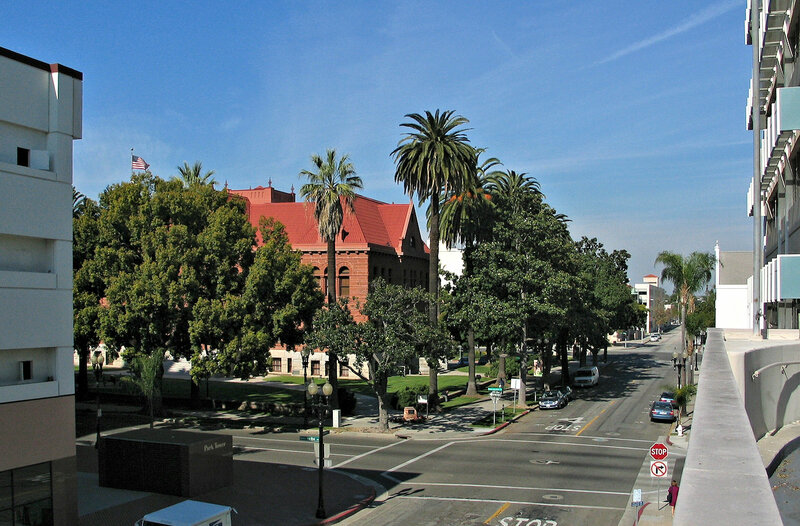 We're looking across the intersection of Sycamore St. and Santa Ana Blvd. (then called 6th St.). The image below shows a modern version of the same scene, from the same angle. Okay,... Let's take a look at the details! First, you'll notice that the cupola is now missing from the Courthouse. The popular story is that it was damaged during the 1933 earthquake and had to be removed. Indeed, it was removed while other repairs were being made to the building, post-quake. But that just provided a good excuse to remove the part of the building that was the most difficult to paint, clean, and otherwise maintain. That said, those will keen eyes will notice that the stone work around the attic windows is different too -- And that WAS a direct result of 1933 quake damage. Those with impossibly good eyesight might also notice that parts of the curbs surrounding the courthouse block are still made of cobblestones, as they were in the early 1900s. Most of the other buildings seen on the periphery and in the background of the early photo are long gone, but First Presbyterian Church remains. One of it's dome-topped steeples appears on the right of the older photo. The post-quake remodeled version can be seen in the modern photo as a white building with a gray roof. The block across the street from the front of the Courthouse has changed completely since the first photo was taken. Today, a shiny glass office building and its white concrete parking garage fill the entire block. 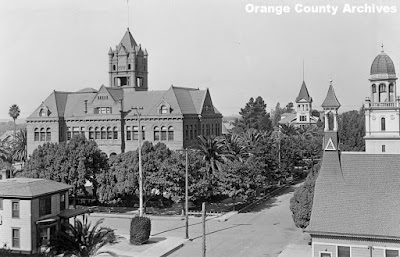 Prior to that, the block at various times held Santa Ana's old Carnegie Library, the Elks' Lodge, a garage, and more. In the older shot, many of the surrounding buildings are churches. 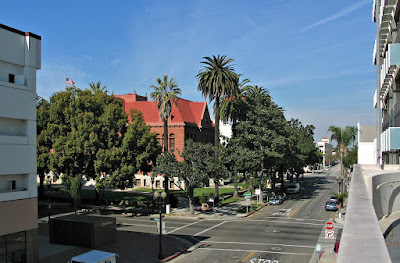 In fact, part of today's Civic Center Drive, behind the Old Courthouse, was originally called Church St. because of all the churches lined up there. In the 1950s, the car culture took over and people moved into the suburbs. Many of the churches followed, building big new sanctuaries on large parcels of land (with their own parking lots) further out amid the tract houses and orange groves. That's it for today. Happy Friday!